Attending today's meeting were: Gerry Ong, Mic Tuason and me. 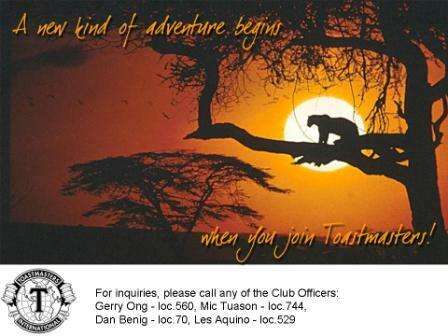 Discussed briefly was a meeting to be scheduled in mid-December which will be the venue for an initial convention of those interested in joining Toastmasters. The media campaign was also briefly discussed. In addition, officers will also be talking personally with engineers as prospective members for the club. Yup, I created the above flyer. It was just a three-man meeting, but I was still excited, nonetheless. Make Them Laugh-Sample Speech, "Motel 101"